Roy Oliver Disney (June 24, 1893 – December 20, 1971) was an American businessman and co-founder of The Walt Disney Company. He was the older brother of Walt Disney. 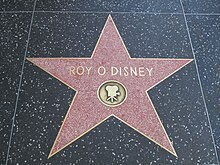 Roy was born to Irish-Canadian Elias Charles Disney and English-German-American Flora Call Disney in Chicago, Illinois. The family moved to Marceline, Missouri, in 1896, and to Kansas City in 1911. On July 1, 1911, Elias purchased a newspaper delivery route for The Kansas City Star. It extended from 27th Street to the 31st Street, and from Prospect Avenue to Indiana Avenue. Roy and his brother, Walt worked as newspaper delivery-boys. The family delivered the morning newspaper, The Kansas City Times, to approximately 700 customers, and the The Kansas City Star to more than 600. The number of customers served increased with time. Roy graduated from the Manual Training High School of Kansas City in 1912. He left the paper delivery route and worked on a farm in the summer. He was then employed as a bank clerk along with his brother, Raymond, at the First National Bank of Kansas City. Roy served in the United States Navy from 1917 to 1919. Roy contracted tuberculosis, therefore, was discharged from military duty. He relocated to Los Angeles and worked as a banker whilst recuperating in hospital. In 1923, his brother, Walt joined Roy in Hollywood and the two planned the start of Disney Brothers Studio. The brothers ordered kit houses from Los Angeles-based Pacific Ready Cut Homes, and in 1928, built their homes adjacently on Lyric Avenue in the Los Feliz neighborhood. Whilst Walt led the creative side, Roy guided the business side and finances. Roy and Walt both founded Disney Studios as brothers, but Walt would later buyout most of Roy's share in 1929 so, unlike Max and Dave Fleischer of rival Fleischer Studios, Roy was not a co-producer. However, Roy would be equal partner in all facets of the production company. Roy became the company's first CEO in 1929, although the official title was not given to him until 1968. He also shared the role of chairman of the board with Walt from 1945. In 1960, Walt dropped the chairman title so he could focus more on the creative aspects of the company. After Walt's death in 1966, Roy postponed his retirement to oversee construction of what was then known as Disney World. He later renamed it Walt Disney World as a tribute to his brother. Roy became the president of Walt Disney Productions on December 15, 1966, until 1968. Roy was married to Edna Francis from April 1925 until his death. Their son, Roy Edward Disney, was born on January 10, 1930. Throughout his life, Roy rejected the publicity and fame that came with being Walt's brother. He was camera shy and a passive individual, resulting in few public photos being in existence. Roy's nephew Charles Elias Disney named his son who was Charles Roy Disney, his middle name after Roy Oliver Disney. After the opening of Walt Disney World in October 1971, Roy finally retired. He died, aged 78, on December 20, 1971 from an intracranial hemorrhage. He is interred in Forest Lawn Memorial Park (Hollywood Hills) in Los Angeles. One of the Walt Disney World Railroad locomotives was named after Roy. On June 6, 2002, his son Roy E. Disney rededicated this locomotive in his father's honor. As of 2016, this locomotive became a hundred years old. One of the Hong Kong Disneyland Railroad locomotives is also named the Roy O. Disney. The Roy O. Disney Concert Hall, the primary performance space for the Herb Alpert School of Music at the California Institute of the Arts (of which Disney was a benefactor), is named after him. A statue of Roy seated on a park bench beside Minnie Mouse is located in the Town Square section of Main Street, U.S.A., at the Magic Kingdom theme park in Florida. A duplicate is located outside the Team Disney building at Disney's corporate headquarters in Burbank, California. There is a third statue at the Tokyo Disneyland theme park. The Roy O. Disney Suite is located on the top floor of the Hong Kong Disneyland Hotel. In 2014, Roy O. Disney was portrayed in the feature film Walt Before Mickey by Jon Heder. ^ Jones, Jack (December 21, 1971). "Roy O. Disney". Los Angeles Times. Retrieved September 24, 2014. ^ a b "Roy O. Disney". latimes.com. Retrieved March 24, 2019. ^ a b c Barrier (2007). The Animated Man: A Life of Walt Disney. pp. 18–20. ^ a b "Gentle Visionary: Roy O. Disney | The Walt Disney Family Museum". www.waltdisney.org. Retrieved March 24, 2019. ^ comments, Chris Queen 2013-06-28T13:00:27 chat. "Roy Disney: The Not-So-Silent Partner". Lifestyle. Retrieved March 24, 2019. ^ Pollard-Terry, Gayle (July 16, 2006). "12,000 easy pieces". Los Angeles Times. Retrieved November 7, 2017. ^ Daniel (August 1, 2009). "Disney's Magic Makers: Edna Francis Disney". Netcot.com. Archived from the original on April 1, 2012. Retrieved October 31, 2012. ^ "The Windows on Main Street: Roy E. Disney". Wdwcentral.wordpress.com. November 30, 2008. Retrieved October 31, 2012. ^ Gino., Wickman, (2015). Rocket Fuel The One Essential Combination That Will Get You More of What You Want from Your Business. Winters, Mark C. New York: BenBella Books, Inc. ISBN 9781941631164. OCLC 904407202. ^ Wilson, Scott. Resting Places: The Burial Sites of More Than 14,000 Famous Persons, 3d ed. : 2 (Kindle Locations 12402). McFarland & Company, Inc., Publishers. Kindle Edition. ^ "Roy O Disney (1893-1971) Grave Site | BillionGraves". BillionGraves. Retrieved August 13, 2017. ^ DeFeo, Todd (July 31, 2015). "A Closer Look at the Roy O. Disney at Walt Disney World". Railfanning.org. Archived from the original on February 17, 2017. Retrieved May 20, 2017. ^ Campbell, Michael (Summer 2002). "Roy E. Disney Rededicates Father's Engine" (PDF). Carolwood Chronicle. Carolwood Pacific Historical Society. pp. 1–2. Archived from the original (PDF) on May 27, 2017. Retrieved May 27, 2017. ^ Broggie, Michael (Winter 2016). "View from the Cupola" (PDF). Carolwood Chronicle. The Carolwood Society. p. 7. Archived from the original (PDF) on May 20, 2017. Retrieved May 28, 2017. ^ "All aboard the Hong Kong Disneyland Railroad". September 6, 2016. ^ "Remembering Roy O. Disney, Walt Disney's brother, 45 years after his death". Orange County Register. December 22, 2016. Retrieved March 24, 2019. 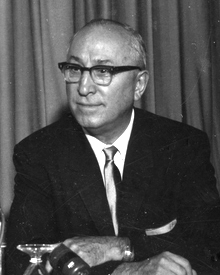 Wikimedia Commons has media related to Roy O. Disney.